Condo living in downtown Sarasota brings with it much more than a place to “hang your hat”. Residents of Sarasota condos are drawn to an ingrained sense of community, wonderful amenities, and the ease with which one can walk out the front door and already be in the center of everything. With so much interest in moving to downtown, the Sarasota skyline has seen plenty of recent activity. There are a total of 85 projects in development, construction or completed within the last year as recognized in the City of Sarasota Development Report (which includes all developments within the city and not just downtown). This renaissance of new construction continues to add to the energy, style, and diversity of our region. Sarasota’s first wave of large condo buildings and complexes arrived in the 1970’s and early 80’s. The second wave of large condo developments came in the 2000’s, which saw eight new buildings, each with 80 or more residences built in downtown Sarasota. Now with new developments such as VUE Sarasota, The Mark, and The Ritz-Carlton Residences, Sarasota, our skyline and downtown continue to evolve. Condos in downtown Sarasota range from small boutique buildings on Golden Gate Point to large towers set on Sarasota Bay. 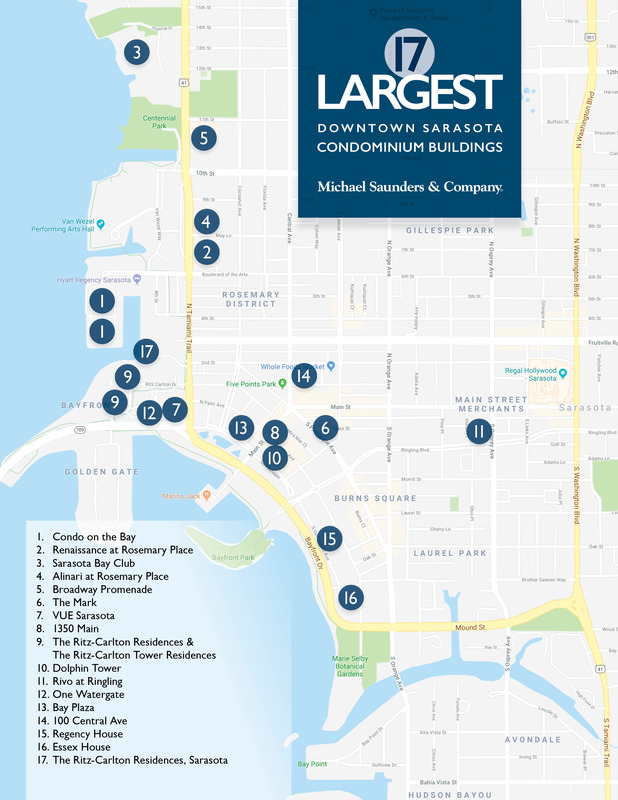 To help in providing the best lay of the land, we are showcasing the seventeen largest condos in downtown Sarasota to illustrate the unique mix of living options. Discover which ones have waterfront views, pools, spas, and fitness centers, are pet-friendly, and even offer boat docks. It seems fitting to start our list with one of Sarasota’s soon-to-be built condo buildings. Waterfront views of Sarasota Bay, spacious balconies, a pool and spa, exceptional Ritz-Carlton service and a modern/contemporary design are some of the highlights of this new Sarasota condo. One item to note is that they are impressive in size; they start at 3,095 square feet and have a minimum of three bedrooms. This is resort-style living at its finest. View The Ritz-Carlton Residences, Sarasota condos for sale. The Essex House is an older building with exceptional marina and Sarasota Bay views, located in the heart of downtown Sarasota. You’ll find one- and two-bedroom residences with private balconies ranging from 1,000 to 2,600 square feet. Key amenities include heated pool, saunas, gazebo, and sundeck. View Essex House condos for sale. Regency House is known for its Sarasota Bay views and its unique gear-shaped design. The building contains two-, three-, and four-bedroom residences starting at just less than 1,000 square feet; many of which have been updated to include modern amenities and luxuries. View Regency House condos for sale. Built in the heart of downtown Sarasota, 100 Central offers one-, two-, and three-bedroom condos that range from 991 to over 3,700 square feet. Amenities include 24-hour concierge services, fitness center, rooftop pool, theater, plus the first floor houses retail shops and a Starbucks. Wholefoods Sarasota is next door. View 100 Central Ave. condos for sale. Built across from the marina, Bay Plaza is a waterfront gem designed by architect Tim Siebert. The building showcases unobstructed views of Sarasota Bay while being located within easy walking distance to the Bayfront, Florida Studio Theatre, Sarasota Opera, and more. Bay Plaza has two- and three-bedroom units and offers resort-style amenities such as valet parking, heated pool, spa and more. View Bay Plaza condos for sale. One Watergate has spectacular views of Sarasota Bay and the John Ringling Bridge. This condo building offers two- and three-bedroom units with lots of natural light and waterfront vistas. Residents love the proximinty to the Ritz-Carlton Hotel and the ease with which one can walk the Ringling bridge every day. Amenities include heated pool, tennis courts, clubhouse, and on-site management. View One Watergate condos for sale. Modern and contemporary Rivo at Ringling sits a few blocks from the waterfront but offers resort-style amenities including concierge, fitness center, bike storage, pool/spa, conference room and more. Rivo offers two- and three-bedroom residences and an inspiring indoor tropical garden atrium. View Rivo at Ringling condos for sale. Sitting between Bayfront Park and Marina Jacks, Dolphin Tower has exceptional views of Sarasota Bay and is in the heart of downtown. Dolphin Tower offers one- and two-bedroom condos that run from 963 to 1,408 square feet. Amenities include exercise rooms, meeting spaces, heated pool and more. View Dolphin Tower condos for sale. Exceptional service and residences can be found at the Ritz-Carlton Residences. Here you’ll find one to four-bedroom condos up to 5,000 square feet. Residents enjoy balconies, waterfront and city views, and amenities like 24-hour in-residence dining, social room, valet, and bayfront pool and spa. View The Ritz-Carlton Residences and The Ritz-Carlton Tower Residences condos for sale. 1350 Main sits a little over a block from the Bay, but because of its height residents still get beautiful Sarasota Bay and marina views. With open concept, one-, two-, and three-bedroom condos from 700 to 3,200 square feet and amenities that include resort style pool and spa, athletic club, clubroom, theater, and more, it is no wonder that 1350 Main is one of Sarasota’s premier residential towers. View 1350 Main condos for sale. VUE is one of Sarasota’s newest waterfront condominium buildings. With a contemporary and dynamic design, 10′ floor-to-ceiling glass windows, modern amenities, expansive balconies, and stunning panoramic waterfront views, these one- to four-bedroom residences, which range in size from 1,515 to 3,415 square feet, are in high demand. Amenities include resort-style pool and spa, fitness center, club lounge, private dog park and more. View VUE Sarasota condos for sale. Providing landmark living in the center of downtown, The Mark is a dramatic new building now under construction with one- to three-bedroom residences from 1,437 – 2,969 square feet. Bringing “downtown downstairs”, The Mark will be home to The Promenade at the base of the building with restaurants and retailers bringing new energy to the street. Residences will feature a sleek modern design, expansive terraces and resort-style amenities that include pool, spa, fitness center, residents’ club room, secured access and a variety of ground-floor businesses. View The Mark condos for sale. Broadway Promenade is located in Sarasota’s arts district and is across from Centennial Park. One- to three-bedroom residences in this community have park, water or courtyard views and are just minutes from restaurant and galleries. Community amenities include garage, pool, fitness center, outdoor grilling area, library, business center and more. View Broadway Promenade condos for sale. Directly across from the Van Wezel Performing Arts Hall is Alinari, which offers Sarasota Bay views to the west and city views to the east. Here you’ll find one-, two- and three-bedroom condos and lofts ranging in size from 1,070 to 3,200 square feet. Alinari amenities include concierge, resort pool and spa, clubhouse, fitness center, wine cellar, climate controlled storage, club room, guest suites, theater and more. View Alinari condos for sale. Sarasota Bay Club is a gated two-building community on the edge of downtown Sarasota. It is unique as it offers independent retirement condos, assisted living services and a 24-hr on-site RN or EMT. The waterfront views are impressive, and amenities include pool and spa, theater, formal and casual dining, fitness center, beauty salon, library and more. Plus, there are planned activities and lectures throughout the year. View Sarasota Bay Club condos for sale. Located in the arts district, the Renaissance offers water and city views while being within walking distance of the Van Wezel Performing Arts Hall and parks. You’ll find one-, two- and three-bedroom condos ranging in size from 475 – 1560 square feet. Renaissance amenities include pool, sauna, fitness center, theater, business center, club room, library, guest suites and more. View Renaissance condos for sale. Poised on Sarasota Bay, you’ll discover Sarasota’s largest condominium opportunity, aptly named Condo on the Bay. This community consists of two 18-story residential towers and five townhouse buildings. Condo on the Bay offers two- and three-bedroom units that range from 1,280 – 2,315 square feet. Condo on the Bay sits on a peninsula and owners enjoy amazing Sarasota Bay sunsets views. Additional amenities include tennis courts, fitness centers, pools, social rooms, boat docks and slips, concierge, and more. Even though it is one of the older condos in Sarasota, it remains in high demand based on location and the amazing waterfront views. View Condo on the Bay condos for sale. Downtown Sarasota is a vibrant destination with galleries, theater, shops, restaurants, and culture. The beautiful skyline and fantastic waterfront views make it one of Southwest Florida’s best neighborhoods. With so many condominium and home choices in the downtown area, it may be a little overwhelming to determine whether a condo overlooking Sarasota Bay or a waterfront home to the north or south of downtown might best fit your needs. What’s more, this list only represents the largest buildings and there are many other smaller residential buildings in downtown Sarasota real estate from which to choose. Michael Saunders & Company has over 40 years’ experience and real estate professionals ready to help you find the right condominium or single-family home in Sarasota. You can call us at 888-552-5228, search for a Sarasota real estate agent, or stop by our Main Street – Sarasota office at 1605 Main Street. We look forward to meeting and working with you.